Join us on September 26th, 9:00 PM EST / 8:00 PM CST for a live, on-air interview with Taylor Quigg, a wife and mother of two who lives in the suburbs of Philadelphia. Taylor was diagnosed with FSHD in 2014 when she was eight weeks pregnant with her second daughter. She has worked hard to overcome the label and show that her diagnosis doesn’t define her. (Read her story in the FSH Watch 2018 Issue 1, page 3.) Taylor is a proud Network Marketing Professional for a global health and wellness company. 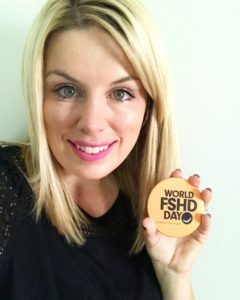 She works tirelessly everyday to spread awareness of FSH and to show others anything is possible with enough determination and drive. You can stream the show on BlogTalkRadio or listen and ask questions on the air by calling (949) 270-5953.